"I think I found my true calling in being a politician. There is that fulfillment in being able to help other people that I did not have as an actress. I am happy to serve the people and be a mother to the people. 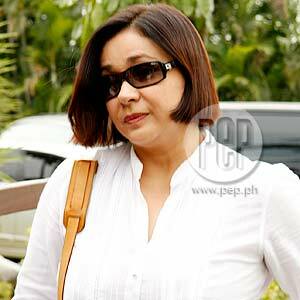 I am fulfilled just knowing that the people love me," says Alma Moreno. Actress and Parañaque re-electionist councilor Alma Moreno said she would not hesitate splitting from her husband, Marawi City Mayor Sultan Fajad "Pre" Salic, after only a year of marriage. Alma, 51, Venessa Lacsamana in real life, made this statement in reaction to an observation that the story of her life and love keeps on repeating itself in her last three relationships and might just happen again with Salic, 49. Speaking in Filipino, Alma said she had never stopped any of her men from leaving her. She was referring to former live-in partners Rudy Fernandez, with whom she has a son, Mark Anthony Fernandez; and Dolphy, with whom she has a son, Vandolph Quizon; and first husband Joey Marquez, with whom she has three children—Yeoj, Win-Win, VJ, and adopted Em-Em. Her marriage to Marquez lasted 12 years and was annulled in 2004. "I'm not one to stop them. I just let them go," she said a few minutes before she went on stage for her last campaign speech on the eve of elections day. Alma's previous relationships broke up apparently because of another woman. In the case of Rudy, the other woman was Lorna Tolentino, whom he subsequently married. Dolphy apparently left Ness (Alma's nickname) for Zsa Zsa Padilla. The couple is still together but have yet to tie the knot even after Zsa Zsa's marriage to Dr. Modesto Tatlonghari was finally annulled in 2004. Joey supposedly left Alma for Kris Aquino, but the two split up scandalously a few years later. Kris has since married James Yap. Alma also had a relationship with Gerald Madrid, who is as old as her oldest son Mark Anthony. "I WANT THIS MARRIAGE TO LAST." She married Fajad Salic, a Muslim, on March 10, 2009 in Cebu City. "I want this marriage to last," said Alma wistfully. "If the world stops, this is it. This is for keeps, for me. I hope this would be the last marriage for me." Alma has remained a Catholic, but said she has been reading the Koran in English. "It's not that easy to convert and become a Muslim," she revealed. "There are many things I have to learn. I even have to go to Mecca. But the time might come that I will become a Muslim." She said the beliefs in the Muslim faith are similar to Christian ideals. "We only have one God. As in Christianity, you have to love people, be true to yourself, to help those in need, and remember to be humble at all times in the Muslim faith," Alma said. "It's not different from what I learned as a Christian and Catholic. I just have to adjust a little." Alma claimed she had never been happier than now that she is Mrs. Salic and Konsehala Ness. "The most important thing in this marriage is that we truly love and respect each other," Alma said. "And as far as my career [as a politician] is concerned, I couldn't ask for more. I think I found my true calling in being a politician," she said. "There is that fulfillment in being able to help other people that I did not have as an actress. I am happy to serve the people and be a mother to the people. I am fulfilled just knowing that the people love me." Her constituents showed this love when Alma was re-elected for a second term as Paranaque councilor.